Many disasters have been recorded from the glaciers in the Cordillera Blanca. 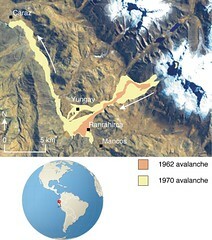 The 1962 and 1970 events originating from Glaciar 511 on the Nevados Huascarán, the highest peak of which is at 6768 m above sea level in the Peruvian Andes, were particularly severe. On 10 January 1962, an ice avalanche took place with an estimated starting volume of 10 million m3; the avalanche travelled down 16 km and destroyed the city of Ranrahirca, where 4000 people died. On 31 May 1970, the most catastrophic rock-ice avalanche known in history was triggered at 3:23 p.m. by a strong earthquake with a magnitude of 7.7. The avalanche originated from a partially overhanging cliff at 5400 to 6500 m above sea level, where the fractured granite rock of the peak was covered by a 30 metre thick glacier. The avalanche, which had an estimated volume of 50 to 100 million m3, travelled 16 km to Rio Santa down a vertical drop of 4 km. Along its path, the avalanche overrode a hill in the downstream area and completely destroyed the city of Yungay, claiming about 18 000 lives.